The Oscar nominations were announced on Tuesday, & while there weren't any real surprises in the Best Picture or the screenplay categories, there were certainly a lot of surprises in the other categories. Here's some of my reactions to the nominations. 1. The Best Picture nominees are really good. The films that are nominated are just about what I predicted would be nominated. However, I disagree with the current Best Picture nomination system. There should either be 5 nominees for Best Picture, or 10 nominees for Best Picture, nothing in between. I personally believe there should be 10 nominees. 2. Mel Gibson's Best Director nomination for Hacksaw Ridge was somewhat surprising, especially considering his previous incidents. While he wouldn't have been my choice for the last nomination, it is a well-deserved nomination. 3. The Best Actor category looks exactly how I predicted it would be. I still haven't watched Captain Fantastic yet, so I will have to see how good Viggo Mortensen's performance is. 4. The Best Actress category was the most surprising. I definitely thought Amy Adams would've been nominated for her amazing performance in Arrival, & I also thought Annette Bening would've been nominated for her career-best performance in 20th Century Women. I was shocked to see that they weren't nominated, & that in their places, Ruth Negga was nominated for her performance in Loving, & Meryl Streep was nominated for the 20th time for her performance in Florence Foster Jenkins. Amy Adams & Annette Bening should've been nominated over Ruth Negga & Meryl Streep. Also, Isabelle Huppert's nomination for Elle was also somewhat surprising. 5. The Best Supporting Actor category was almost exactly how I predicted, for I did not predict Michael Shannon's nomination for Nocturnal Animals. 6. The Best Supporting Actress category was not surprising; however, Viola Davis should have received a Best Actress nomination for Fences instead of a Best Supporting Actress nomination; in her place, I would have nominated Greta Gerwig for 20th Century Women. 7. The Best Original Screenplay category was exactly how I thought it would look. I loved that The Lobster got nominated in this category. And I especially loved that 20th Century Women got nominated in this category. 8. The Best Adapted Screenplay category worked out how I thought it would; however, I thought that Nocturnal Animals had a shot at being nominated here. 9. Silence only got nominated for Best Cinematography? This deserved a few more nominations than that. 10. Arrival should've been nominated for Best Visual Effects. The visual effects in that film were so astounding. So, those are my 10 biggest reactions to the Oscar nominations. Soon, I will be posting my Oscar predictions, my Top 50 films of 2016, & my film awards for 2016. 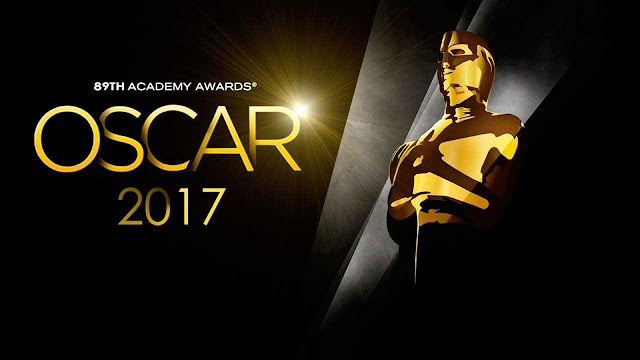 And also, don't forget to watch the Oscars on Sunday, February 26 at 8:30pm on ABC! Thanks, Mr. Bill! I love what you did with the intended misspelling!